Maud Montgomery used her imagination to write these stories and I believe she would approve of Kevin Sullivan’s work. 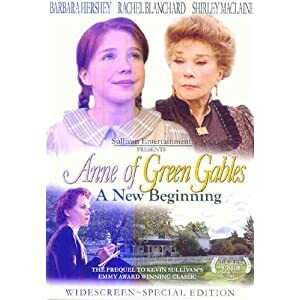 I was fully ready to reject Barbara Hershey in her roll as Anne Shirley in Kevin Sullivan’s latest creation, Anne of Green Gables – A New Beginning. I simply couldn’t imagine her playing Anne Shirley, when all that stuck in my own mind was her role in Beaches, where she played opposite Bette Midler. Hershey did a fabulous job in her role as Anne and I love the way Sullivan wove the story around in order to fill in many of the blanks viewers were left with in his previous Anne of Green Gables series of films. I love Anne of Green Gables. I’ve read every book written by L.M. Montgomery, practically every book about L.M. Montgomery and I’ve seen a number of adaptations of Anne in various forms from plays to movies. This movie has nothing to do with Anne of Green Gables or L.M. Montgomery. Obviously, this author doesn’t realize that Anne of Green Gables was a series of stories by L.M. Montgomery, not an autobiography. Lucy used her imagination and wrote from her heart. Kevin Sullivan masterfully wove a story together that keeps Anne of Green Gables alive and growing, which I find refreshing. I loved watching the characters in the original Anne of Green Gables trilogy. I think I would watch anything with Megan Follows and Richard Farnsworth was a fabulous actor. If you enjoy watching Barbara Hershey and Shirley MacLaine, you will enjoy this movie. However, if you are a hard-core fan of the Anne of Green Gables books in their pure form, don’t bother — you will hate it. I pull out Anne of Green Gables and watch the entire Kevin Sullivan series every couple months. I watch this newest addition right along with the others, without too much trouble with the character switch. This entry was posted in Genre: Classics, Genre: Kids & Family and tagged Anne of Green Gables, Barbara Hershey, DVD, film, Kevin Sullivan, Lucy Maud Montgomery, movie, orphan, review, Shirley MacLaine by Shawn & Annette. Bookmark the permalink.